Pope Francis: A Man of His Word is a new documentary of the Pope, directed by acclaimed German director Wim Wenders. 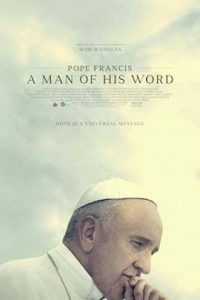 This new film is not so much a biography of Francis, as it is a window into his heart, soul, and mind. Much of the film features the Pope speaking directly into the camera on a wide variety of subjects, from his desire to make the Church a Church of the Poor, to his concern for migrants and refugees, and the environment. Francis appears very thoughtful on all these subjects, as the camera capturing his kind, loving face. Wenders also follows Francis on his travels throughout the world, from the Philippines in the midst of a monsoon, to Africa, Bolivia, Jerusalem, the United Nations, and the United States Congress in Washington. Wenders captures Francis reaching out to the people and touching them, especially children, the poor, and the sick. We see him visiting prisoners and refugee camps on the Greek Island of Lesbos. There are many powerful scenes, including one with Francis on a boat in the Mediterranean, watching migrants from North Africa on overcrowded boats seeking a better life in Europe. In another poignant moment, Francis walks alone, deep in thought, at Auschwitz. So often, Francis walks with the suffering of the world, as he communicates God’s love for them, and lets them know he is praying for them. The plight of the suffering is a frequent topic of Francis’ speeches to the Church and world leaders. Wenders also captures the Pope as one who dialogues. He famously talks to the press on airplanes, returning from his journeys. He is open to their questions, and wishes to be transparent. He tells journalists that the Catechism teaches us to welcome the gifts of homosexual persons in society. In answer to another question, Francis speaks of the sin of pedophilia in the Church. Francis advocates a zero tolerance of sexual misconduct with minors in the Church. This subject was particularly timely at this moment, with the recent announcement that the Chilean bishops have offered their resignations over the mishandling of priests accused of sexual misconduct with children. It’s remarkable that, in dialogue, Francis is present to the moment, and listens to others, whether it’s a world leader or the mother of a sick child. He never comes across as patronizing, but as one who is compassionate, seeking understanding. A third interwoven dimension of the film focuses on St. Francis of Assisi, whose name the Pontiff took as his own. This is the only part of the film using actors who portray St. Francis and two of his followers. Shot in grainy black and white, presumably to make it look old, this is the weakest part of the movie. These scenes are awkward, and take away from the overall effect of the movie. Despite the serious subjects that the film deals with, Francis is often joyful and smiling, especially when he is among the people. I felt that he truly appreciates the joy of the Gospel and the love of Christ in his life, and does not give in to hopelessness and despair. It’s unlikely that the movie will be in theatres long. Even though the Pope is something of a rock star, I doubt that this film will be able to compete with The Avengers and Solo. However, Francis: A Man of His Word will probably be available for showing before long in parishes, schools, and other venues, where it can be seen and discussed, perhaps with a study guide. This would be an excellent opportunity to appreciate the spirituality of this great man, whose joy, simplicity of life, and compassion, have touched the world.